Coach Greg often provides a breather during footwork by asking what interesting events are coming soon. There's always something fun! Many Salle members look forward eagerly to teaching in the Dogberry's School of Fencing booth at the Northern California Renaissance Faire in Hollister each year. 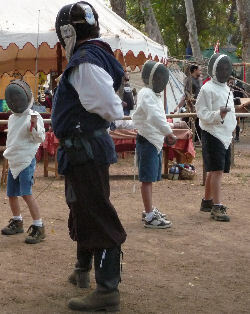 Faire patrons (both children and adults) can receive a basic fencing lesson as part of their historical experience! They quickly learn to advance, retreat, lunge and parry; the lesson climaxes with a short but exciting bout, tailored to each student's needs. Jake's of Sunnyvale is the Salle's dining room. 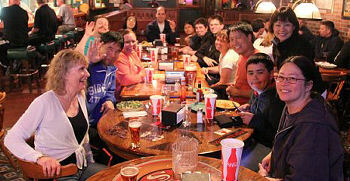 Traditionally, we mark the final night of a beginning course by going to Jake's for a "graduation" celebration after class! Some fencers gather there for a bite and drink after the intermediate/advanced class almost every week. A chorus of "Beer!" greets the sound of a blade clattering to the floor in class. This references the never-enforced custom of the fencer who drops a weapon buying a beverage pitcher — beer, cola, water, whatever — to share. (You may also hear "Fries!" when a mask is dropped, or "Pizza!" if something yet larger falls. Again, this is just a cheerful custom, not an expectation.) At Jake's, "Look! A moose!" means that the speaker will refill your glass for you, if you will look away and pretend not to notice.